The tough trek into Walcott Inlet is the best wilderness trip in the whole of the Kimberley. Who says? Ron and Viv Moon do! The climb up Magpie jumpup is tough. I slipped the Patrol into low-first and let the transfer box’s Gearmaster rock-crawling cogs haul the Patrol and the Tvan up the rock ledges, the engine ticking over just above idle. The jumpup we were traversing is just one of a number of steep, rocky climbs on the track to Walcott Inlet in the Kimberley’s far west. The only access these days is via Mt Elizabeth station and while the entry fee of a hundred or so bucks may seem a little steep, you only have to realise it takes a crew from the station and Bachsten Camp two to three weeks to cut the track through after every wet season ends to know that it’s worth every cent. 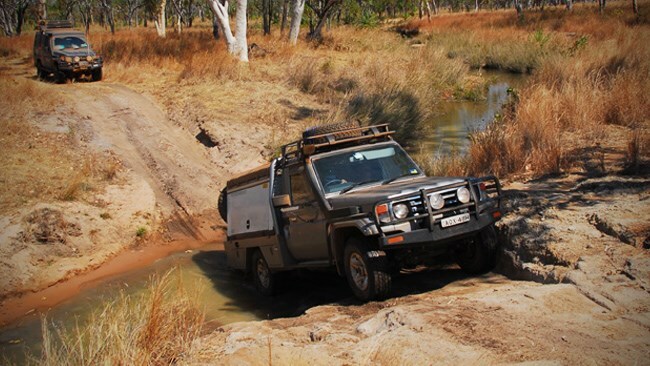 This vehicle track was first established by Peter Lacy (current owner of Mt Elizabeth) and his brother back in the early 1960s to open up access to the Munja pastoral lease for a new purchaser. Since then, the Lacys have kept the track open and it has never been an illegal track, as some local greenies would like to promote it. Along the way you’ll also cross a few creeks and a couple of major streams, which, in the dry season, are generally nothing more than a pleasant trickle over some rocks. Nearby there is nearly always a spot to camp. Passing through the rugged ranges, the observant traveller will see a cave or overhang here or there and closer investigation will often reveal some fabulous Aboriginal art. A giant reclining Wandjina (sea spirit) decorates one cave we found while in another the many heads of mouthless Wandjinas dominate the rock canvas. In others, we’ve found the age-old remains of burials while in hidden places we’ve found the enigmatic Bradshaw figures, their lithe bodies still seeming to dance to some ancient rock music. Bachsten Camp, about two-thirds of the way along the route on the edge of Bachsten Creek, is a top spot to spend a couple of nights. 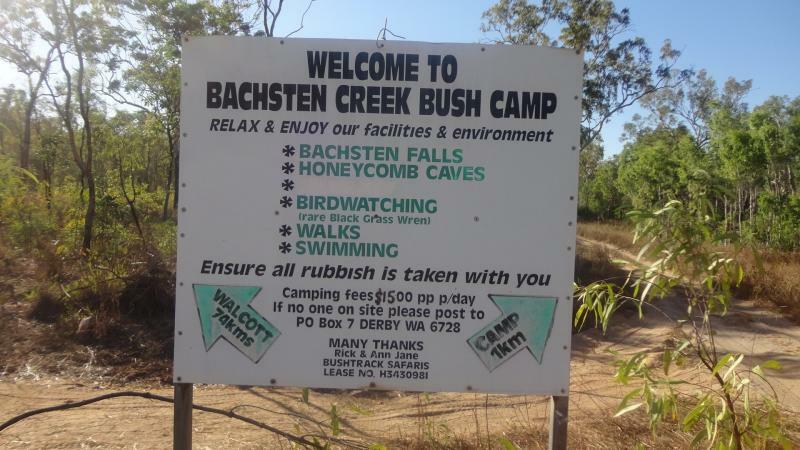 In the surrounding hills and rocky outcrops there is plenty to discover and after a hot day of walking and exploring the creek is a delightful spot to cool off. From here, the track gets rougher and tougher, although you may have thought that would be impossible. Still, halfway up one climb is the closest place to stop for the short, rocky walk into Wren Gorge. Here, a large pool surrounded by red-raw rock cliffs receives its water from a trickling waterfall. It is a magical place. You’ll pass the remains of Munja Camp and of the old mission close by. Just a couple of kilometres later, and about 220km from Mt Elizabeth homestead, you’ll come to Lone Dingo Camp on the edge of the inlet, marked distinctly by three large boabs. This place is at times mossie and sandfly city, but the fishing is something else and there are few places as remote as this that you can reach by vehicle – in Australia, let alone the Kimberley! you must contact them beforehand. Hot showers, toilets and a pleasant camping area are provided. This route is closed during the wet season, generally up until May, when a team and tractor has slashed the route to Walcott Inlet.